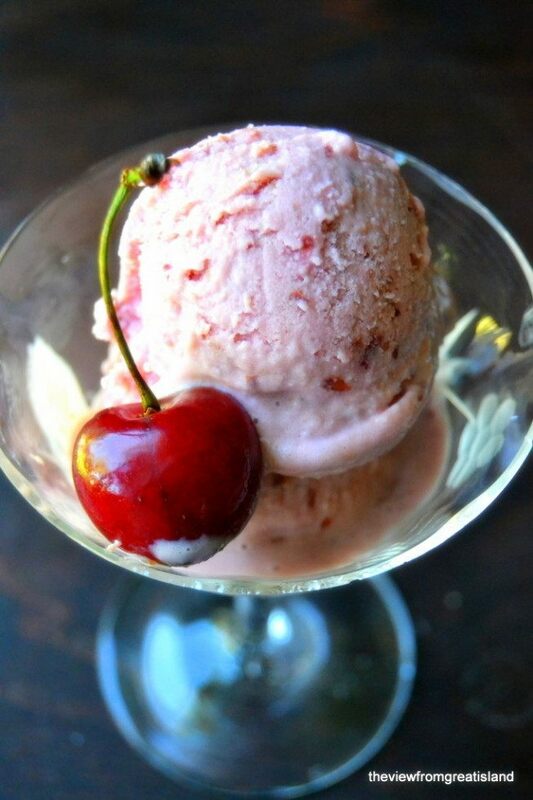 Easy Cherry Frozen Yogurt ~ this healthy no churn frozen yogurt recipe needs no ice cream maker, just frozen cherries, and yogurt! Pit the cherries and lay them out on a baking sheet. Put the pan in the freezer and freeze until solid. Freeze the yogurt along with the fruit before processing. Spoon it into a large zip lock bag, close the zipper, and then lay the bag flat on the same tray with the fruit. Flatten the yogurt out. When ready to use, cut open the bag, and break apart the yogurt. Process the frozen cherries until they are well chopped. Scrape down the sides of the machine as necessary. Work rather quickly so the cherries remain frozen. Immediately add the yogurt, Amaretto, if using, and flavoring. Process just until smooth and thick. Don't over-process or the heat of the machine will start to melt the mixture down. Eat right away, (best) or spoon the yogurt into a container and freeze until firm. Remove from the freezer and let soften a bit before serving.